It all started in 3rd grade, when Will Deucher picked up a pencil and started drawing pokemon during class at Parma’s Incarnate Word Academy. Ever since that moment, art has been an integral part of his life. 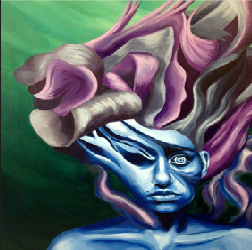 Deucher’s latest piece, “Untitled,” is a self portrait; done with acrylic paint on canvas. “I tried to focus on using a good mix of warm and cool colors to create contrast,” says Deucher. The piece took no less than 12 hours over the course of two days to complete. It was a long, yet rewarding process. First, he utilized a thin coat of acrylic paint, “to get contour down.” Once it was outlined, he used opaque paint for the rest. Through this process, Deucher was masterfully able to showcase a variety of blending colors and a contrast of dark and light shades. In addition, throughout the whole piece, Deucher decided to stay simple with a synthetic brush. It’s not just Deucher’s artistic skill, however, that makes this impressive portrait worth looking at. After talking to Deucher, one has to appreciate the thought he put into the piece. To start, the background is black to put more focus on the figure. Contrary to our original assumption, the green hair is not the result of an accidental paint brush slip. In reality, Deucher purposefully painted his hair green. “At the time I wanted to dye my hair green, but my parents would not let me, so I did it on the painting instead,” said Deucher. On top of that, the green color on the hair, the blue on the shirt, and the yellow hues on his face are all analogous colors. Deucher explained that these colors were employed to give off a calming effect. When asked about a career in art, Deucher gives the diplomatic answer, “I’ll take what I get,” because he feels a career in art may not be too practical, and he even admits that “I may lose interest in it eventually.” We can’t be sure where art will take Will Deucher; but by the looks of things, he has a promising future ahead.